The Wild Beasts of the Wuhan by Ian Hamilton – The third Ava Lee mystery thriller starts with the Toronto accountant on a cruise in the Caribbean with her parents, sister, brother-in-law and nieces. Tension is high as mother and brother-in-law are in constant conflict. When Uncle calls Ava asking her to come to Asia to visit the extremely wealthy Wong Changxing, the emperor of Hubei, little persuasion is needed. While Wong dislikes the title it reflects his prominence in the province of Wuhan. It will be a return for Uncle who had grown up in Wuhan. Wong and his second wife, May Ling, are angry and embarrassed. Wong, a man of modest origins, built up an extensive collection of classic Chinese ceramics. He then fell in love with Fauvist (Impressionist) paintings and built a beautiful collection of 20 paintings. Where the Chinese collection was probably put together more for the status it brings than the love of ceramics building Fauvist collection reflects a more genuine appreciation by Wong for the paintings. Unfortunately a majority of the collection is fake. Wong paid over $70 million for forgeries! Wong and May Ling want Uncle and Ava to find the criminals and Wong will exact retribution. Return of the money is not his goal. Uncle and Ava are not willing to participate in such a scheme. Their business is the collection of money not killing. Uncle is ready to walk away. May Ling convinces Ava to at least do some research into the fraud. Ava agrees to look into the con but it will not to be to identify fraudsters to be killed. The trail is very cold as the Hong Kong broker, Kwong, through whom the Wongs bought the paintings died a few years earlier and his family destroyed all his records. Starting with the basic strategy common to all fraud investigations, Ava looks to follow the money. While business accounting records may be gone there are other sources of financial information. Government tax records and accountants maintain their own documents. Uncle’s web of Chinese connections soon allows Ava to search through the accounting records of Kwong. They make it clear that he was duped as much as Wong and was not part of the fraud scheme. Those records take Ava to London and later to the Faroe Islands. The isolated Islands make them one of the most unlikely of locations in the world to be pursuing art fraud. Still Hamilton provides a credible reason for the investigation to travel to these remote islands in the North Atlantic. Ava’s investigation takes her into the murky world of high value art. With millions to be made ethics are secondary and integrity but a word to be uttered to those collectors seeking reassurance when buying paintings worth huge sums. Wong has a similar family also with three wives. In fact, each of the wives lives with their children on an individual floor of his 8 storey home. While the relationships would seem likely to cause discord they appear to be successful plural families. Unlike some of the earlier books in the series violence is not prominent. At the same time I was a little disappointed. It is really a grinding procedural with Ava moving from one lead to another. I should rejoice in the realism of the story but I did not find the sparkle of the earlier books. The Wild Beasts of Wuhan read easily but I expected more to the plot. What was intriguing in the story is that Ava and Uncle are becoming more amoral in their collection business. They do not have the strong moral code Travis McGee followed in his salvage operations. I will continue to read the series. Ava is a most intriguing character and I want to see how Hamilton develops her in the coming books. 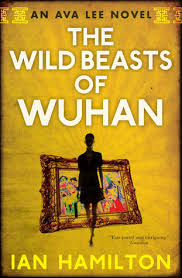 The Wild Beasts of Wuhan will be the 2nd of 13 books I have read in the 8th Canadian Book Challenge hosted by John Mutford as his blog, the Book Mine Set. Bill - It is good to hear that there's less violence in this novel than there is the previous novels. But I know what you mean about a novel having 'sparkle.' I'm sorry to hear that this one didn't really keep you drawn in quite as much. Still, it certainly sounds like an interesting plot, and I always like learning more about the way people from different cultures look at life. Margot: Thanks for the comment. It is a good book. I shall see with the next book whether the series or just this book has gone from great to good. Love that title, Bill! this sounds intriguing, I like the setup, but perhaps should start with an earlier book from the series? Moira: Thanks for the comment. I would definitely start with the first in the series. I think Ava is your kind of sleuth. She is meticulous in how she dresses. This review was fortuitous, I had just read about this author in my latest Deadly Pleasures magazine. He was in an article titled Five More Crime Writers You Need to Read, with a good overview and reviews of two of the books. He was already on my list due to your earlier reviews, but that article and this review pushed him up a bit (even though you were lukewarm about this book). The family relationships sound very interesting. TracyK: Thanks for the comment. I have not been familiar with Chinese multiple "marriages". It creates a different family dynamic.